I signed up to run the Country Music Half Marathon in January. The big race was on Saturday, April 28th. But I didn’t run. 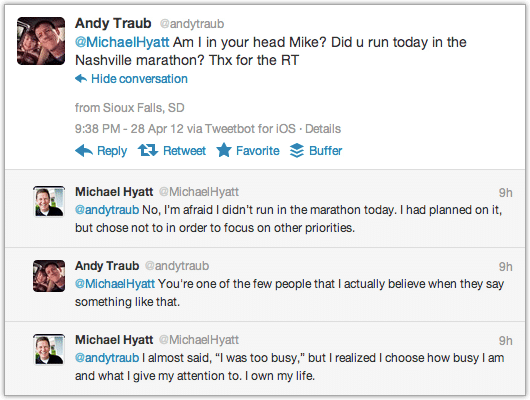 On Saturday, several friends asked me how the half marathon had gone, including Andy Traub. Here was my exchange with him on Twitter. This situation made me realize again the importance of owning my choices. We can’t always choose what happens to us, but we can always choose how we respond. Viktor Frankl, an Austrian psychiatrist who survived two-and-a-half years in Nazi concentration camps, made this case in his bestselling book, Man’s Search for Meaning. It’s easy to subscribe to this in theory, but what about your specific situation? Are you willing to own it? Are you in a job you hate, living for the weekends? Are you unemployed or can’t find a job? Are you stuck in a bad marriage or going through a divorce? Are you overweight, out of shape, or sick? Are you lacking deep, meaningful friendships? I am not asking these questions to shame you. I have gone through my share of setbacks and failures. I have been fired (more than once). I have gone through a business failure. I have felt stuck in a job I hated. I have gone through a protracted and expensive IRS audit. I had to have emergency surgery when my gall bladder ruptured. I have had a child in rebellion and on drugs. I have had two daughters with chronic illnesses. I have lost money on three out of four houses I’ve owned. No, my life has not been a bed of roses. I’ll bet yours hasn’t either. But blaming our circumstances or other people—even when they are partly or almost totally responsible—only makes us victims. It robs us of our freedom and keeps us stuck. There is a better way. Change is possible. It can begin today. You don’t have to stay stuck in the state you are in. 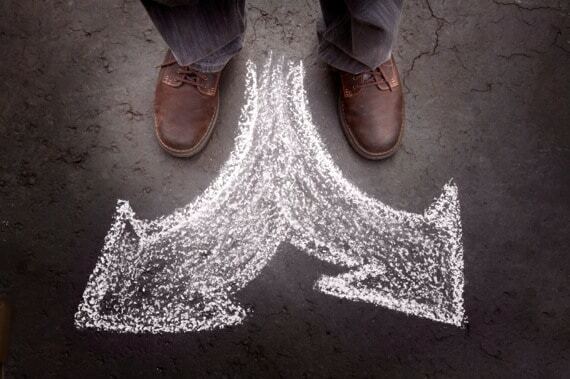 But first, you must own your specific situation and take responsibility for the choices that led to it. Only then can you begin to create a different future. Question: What situation do you need to own? You can leave a comment by clicking here.